For most of our blogs, we write about the three main drains that contribute to the most common needs for drain cleaning: the sinks, the toilets, and the shower drains. Sinks because people send way too much grease down, toilets because people flush things they shouldn’t, and showers because people lose a lot of hair when they wash.
For decades after running water entered the home, these were the only three drains that people needed to worry about. When people were washing their clothes, they’d do it by hand and would wash clothes outside or over the sink, without adding another drain. The first electric (automatic) washing machines started showing up around 1937. On the most basic level they were not too different from what we have today and wouldn’t have had dedicated freshwater lines. Instead they would have been placed close to a sink and a hose would be attached to the sink spout. When it was done, another hose would transfer the wastewater back to the sink’s drain. Once again, everything was retrofitted and no new plumbing would have to be installed. However, the threads and lint from the clothes (not to mention the mud from the largely agrarian society) would have caused fairly frequent drain cleaning. After World War II, everything changed. During the war new washing machines weren’t being made because of conservation of materials. But when the GI’s came home it created a housing boom, which lead to attached garages, televisions, and connected plumbing for our friend the washing machine. 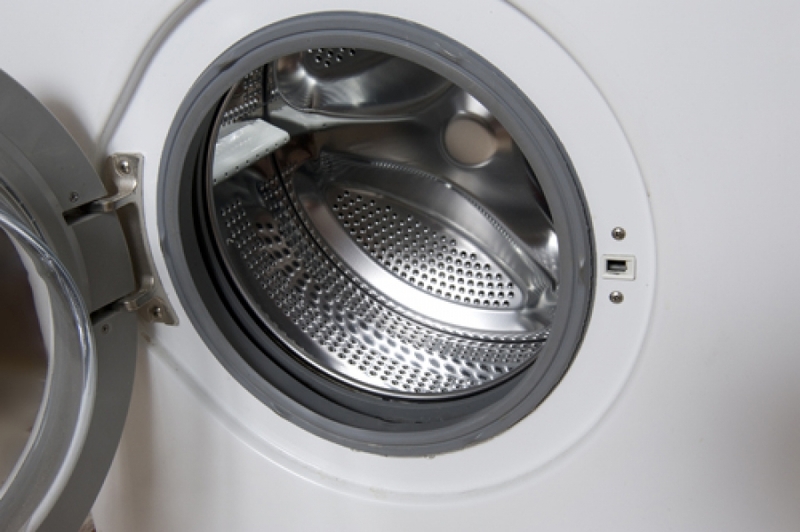 So there’s a bit of history about how people have washed their clothes, but how can washing machines create havoc with our sewer system? Lint: If you read Parade in the Sunday paper, you’re probably familiar with Marilyn vos Savant. Marilyn responds to reader’s questions about every topic under the sun, but one caught our eye a decade back when a reader asked where all of the lint in the dryer’s lint trap comes from. After all, his clothes were years old, shouldn’t the extra material from the manufacturing process have been washed away long ago? Marilyn informed the reader that most lint doesn’t come from the manufacturing process, but by the constant disintegration of clothes…your clothes lose tiny pieces of themselves every time you wash and dry them. This is pretty evident whenever you clean out your lint trap, but you simply don’t see all of the lint that heads out your washing machine drain. It’s usually not a problem, but if you’re one who buys a lot of new clothes (which do shed more lint initially than old ones) and use too much soap in the washing machine, it could lead to the need for premature drain cleaning. Mud: Some of us “mud” more than others. There are farmers, dirt bikers, and those of us who just like to get dirty in the garden. The dirt and dust get wet and actually get harder to deal with than when they were dry, and if they combine with the lint and the soap then you can have real drain cleaning problems. If your washing machine drain in the culprit in your problem, give Garvin’s Sewer Service a call. We’ll be sure to get your drains cleaned in Denver or anywhere along the front range. Why So Many Drain Cleaning Calls On Monday? When Your Car Wash Needs Commercial Drain Cleaning, Give Garvin’s Sewer Service A Call! Are you ready for a winter sewer service emergency? 4 Signs That You Might Be Needing Sewer Cleaning Soon What’s Going On With My Dishwasher Drain?